Guardian Industries, a world wide leader in the glass, automotive and building materials manufacturing is headquartered in Auburn Hills, Michigan. With 19,000 employees on 5 continents in 21 countries, Guardian's products are sold around the world. Guardian Industries was founded in 1932 as Guardian Glass Company. They manufactured automobile windshields in Detroit, Michigan. In 1970 Guardian opened its first float glass production line in Carleton, Michigan. They now have 25 float glass lines in 24 facilities. Guardian produces anti-reflective films directly on glass and is "...one of the largest glass vacuum deposition coating companies in the world. "1 Over the years, Guardian expanded to become the only company producing glass and trim products for the automotive industry. 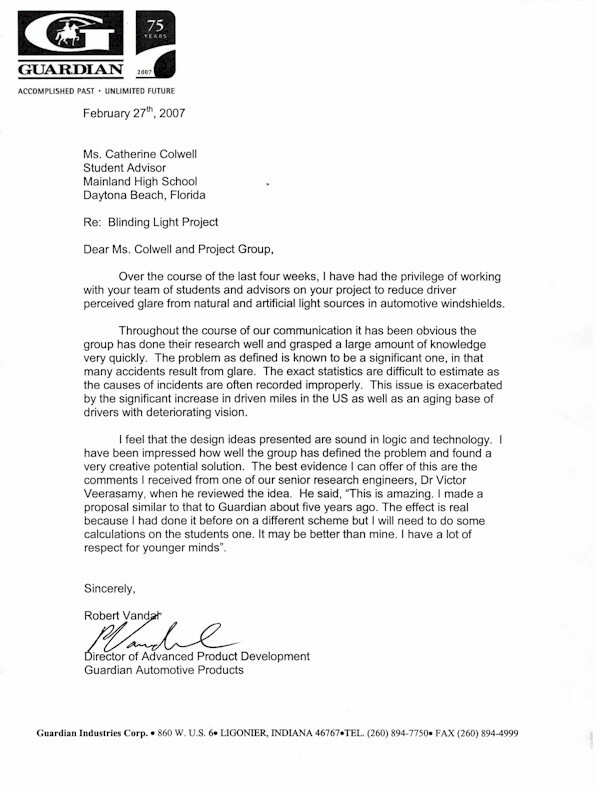 Guardian strives to have "continuous improvement of products and services", by running a science and technology center in Carleton, Michigan. They also have research facilities in Warren, Michigan, and Llodio, Spain. Today, Guardian is the largest manufacturer of mirrors in the world. MacDermid AutoType produces "market focused technical innovation at the touch and vision interface." It maintains worldwide coverage by virtue of its three locations in England, Singapore and the U.S.A.
Its market covers membrane switches, electrical switches, TV remote controls, as well as microscopically replicating patterns in film coating, such as moth-eye diffraction gratings. For the 2005 fiscal year Autotype averaged revenues of $86.5 million and employed 390 people. Autotype was acquired by MacDermid on June 14, 2005, for $81.3 million, from Norcros Plc, the 40-year public limited company owner. MacDermid Autotype produces combined anti-reflective and anti-glare films to optimize performance in applications where low-reflection and high-transmission are required. It is a world leader in producing precision nano- and micro-structures onto film substrates. National Glass Association, (NGA) is a trade organization that represents companies in the flat glass industry. Its mission is "to provide information and education, as well as promote quality workmanship, ethics, and safety in the architectural, automotive and window and door glass industries". Founded in 1948 the NGA has grown to nearly 4000 members. For whom they provide training, information and representational services. The NGA is lead by volunteers from various companies in the glass industry. The association has its national headquarters in McLean, Virginia with affiliated chapters throughout the United States. Also the NGA has volunteer committees who study and oversee different sectors of the glass industry. NGA members receive newsletters, discounts, safety guides and organization publications such as Glass, Auto Glass and Window & Door magazines. Also the NGA holds the National Auto Glass Conference & EXPO, where members can learn about new products and meet each other. This year the convention will be held in Orlando, Florida during February. Industry Certifications are provided by the NGA at various locations, including online. In addition the NGA operates The Coalition for Auto Glass Safety & Public Awareness (CASPA), which promotes consumer education about the importance of glass as a safety component in automobiles. The marriage of nanotechnology and nano-optics to everyday items is found in our product, the Moth-Eye Windshield, which will reduce glare through the use of nano-optic technology. When light intense enough to cause disabling glare strikes the windshield, its behavior is changed so that it is dispersed over a larger area so that the intensity striking the driver's eye is reduced. It is analogous to the idea that a tiny LED 'appears' brighter than a candle flame with the same luminosity due to the fact that the candle flame's luminosity is spread out over a wider area. The moth eye grating is produced on the nano-scale so the grating features themselves are exponentially smaller than what is visible to the naked eye and will not obscure the driver's vison. Since the behavior of light is different at this level, it is possible to let in the light we want to see and reduce the glare caused by Blinding Light. Via the Internet, locate a company that might be able to manufacture your team�s proposed product. Send the company an e-mail asking that someone in the company evaluate the product your team proposed. If your team is not able to obtain a response to your inquiry, provide on your website an example of the e-mail request you sent and the names of manufacturers to whom you sent the request.